How do paintings convey narrative? Rose Piper’s painting “Eve and the Serpent” (c. 1988) and Hendrik Bary’s sketch “Wine is a Mocker,” (c. 1670) answer this, capturing a trickster’s wink at the viewer. Juxtaposed, the two works contrast temptation versus the reality of sun. Furthermore, the deceiver of each piece serves an anti-feast. Piper’s piece is full of motion. 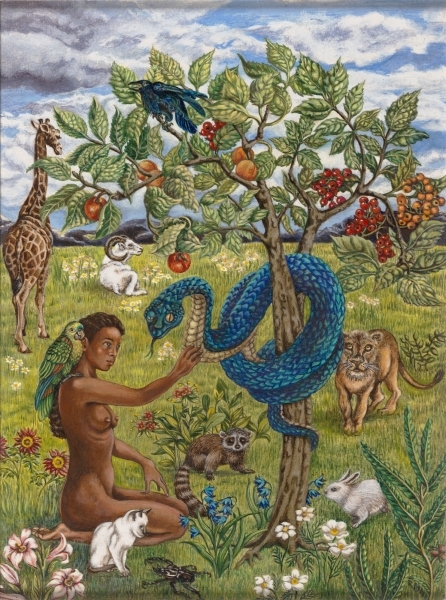 With her head tipped, Eve reaches out to the snake, coiled about the tree. His wink, their motion, and the bright colors, paint an alluring picture of temptation. This motion is fitting as “Eve and the Serpent” originates from an African-American slave song “Dese Bones Gonna Rise Again,” titled after a resurrection prophesy in Ezekiel 37:7-8. Adam, present in the original Hebrew text (Parker). If Piper’s colorful, active work showcases temptation, Bary’s “Wine is a Mocker” sketched the result. As its title suggests, the mocker’s foolish wink really mocks himself. 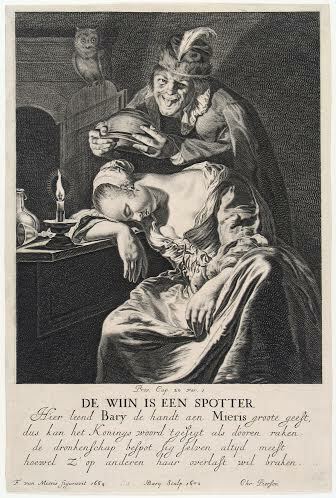 Her stillness and his erratic teetering sharply differ from Eve and the snake’s graceful movements as the temptation differs from consequence, the painful second half of sin’s narrative. Furthermore, both works marriages lack communion, showcasing an anti-feast. Eve instead dines with sin, while a husband’s drunken antics plant seeds of strife. In light of the Piper’s works Biblical context Matthew 5:23 proclaims, “Therefore, if you are offering your gift at the altar and there remember that your brother or sister has something against you.” If God refuses food brought to his alter in strife, then a meal defined by sin must offer the narrative of the anti-feast. Holy Bible. Grand Rapids: Zondervan Publishing House 1984. Print. Parker, Julie Faith. “Blaming Eve Alone: Translation, Omission, and Implications of עמה in Genesis 3:6b.” Journal of Biblical Literature 132.4 (2013): 729-47. Web. 20 Mar. 2015.